Within my first two days at JVP, I became involved in helping organize the recent University of California Office of the President (UCOP) Signature Drop Event on July 7. 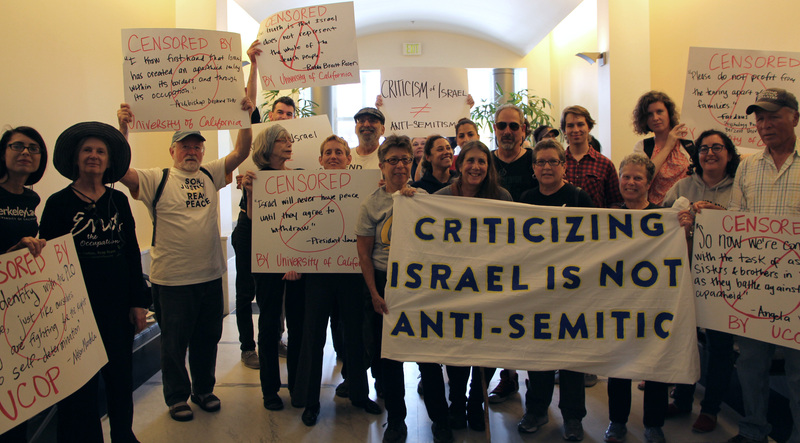 As a student who has been involved with various social justice movements at a school which tends to the side of suppressing free speech, when I heard of the UC Regents’ plan to adopt the State Department definition of anti-Semitism, I feared for the worst. I saw one of the bastions of student protest movements falling to the wayside as emotive arguments replaced logic and moderated debate. We originally reached out to our campus network in an attempt to get as many students involved, but due to it being summer, most students were involved with internships or employment, and as such, had difficulty attending the actual event; however, this did not stop them from adding their name to the petition circulated by JVP (which ended up collecting over 4000 signatures!!!) 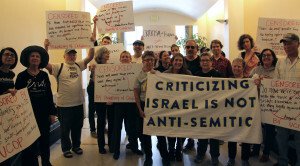 telling Janet Napolitano that the UC community was not behind her in supporting a flawed definition of anti-Semitism. Those that were able to make it were joined by local community activists, alumni, and members of UAW 2865, all of whom congregated in the lobby of the UCOP office to join in chants and present posters with statements made by the likes of Nelson Mandela, Hillary Clinton, and Archbishop Desmond Tutu that would be considered anti-Semitic if the State Dept. definition were adopted. After some waiting, a high-ranking representative from Pres. Napolitano’s office came to meet with us and accepted a printed version of the petition and signatures under the assurance that it would reach Pres. Napolitano directly before the end of the day, and that we would receive confirmation. Sure enough, by the end of the day, we received word that she at least knew the petition was on her desk. Three weeks later, it was reported that the UC Regents would not be discussing the adoption of the State Department definition in the July meeting, but rather, would be discussing a more general statement on intolerance in their September meeting. Since then, we have continued to raise awareness of the issue, with the hopes that when the school year begins, students and professors will begin to organize on other campuses to ensure that similar proposals are not considered. Overall, not only was I able to gain a better understanding of the steps needed in order to organize an event that integrates both students and local community members, along with contacting news sources, but more importantly, we were able to successfully and peacefully demonstrate to the officials that the individuals comprising the institution they are meant to be developing did not agree with their stated goals.